An exterior marked by a distinct chevron zigzag roof sprawls the tiny Dutch town of Zwolle in the Netherlands. 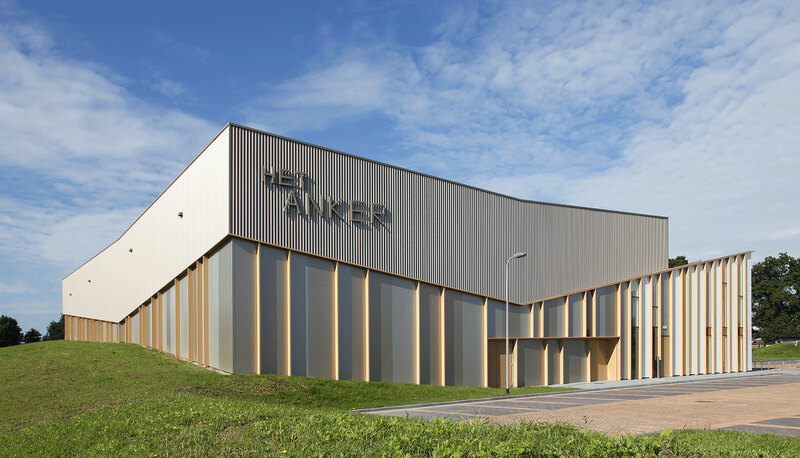 It is the new community center, named Het Anker, attracting people from nearby districts including Westenholte and Stadshagen. Rottderdam based MoederscheimMoonen Architects submitted the winning proposal that won the architectural competition for the project. 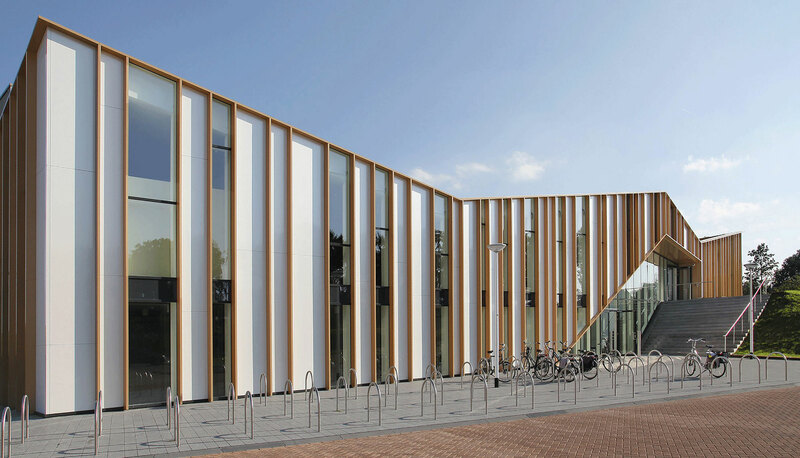 Erik Moederscheim and Ruud Moonen designed the new center that also houses an educational facility, performance hall, and spaces for recreational activities. Chevron zigzags cut the landscape on the multi-purpose complex. A distinct green roof and a veil of transparent and opaque columns mark the site, built on a hill. Visions of interior interaction are broken up with panels of Alucobond aluminum composite material in several shimmering shades of: Sparkling White Silver, Champagne Metallic, and Bronze Metallic. The Alucobond panels create obstructions to views to the interior so that depending on where one might stand the experience of the structure is unique. By aiding to create these vantage points, Alucobond plays a major role in the dynamic experience of the building and helps in bringing people from different neighborhoods to congregate at a centralized location. The modern building unites nearby regions and people from the small community. The structure takes advantage of the sloping terrain with disparate heights by setting a portion of the building underground. Above ground, the angular roof creates a clean contrast against a lush landscape, while the entrance opens up into a grand gesture. Connecting the building at an intersection, halfway along the sidewall, is an exterior staircase. 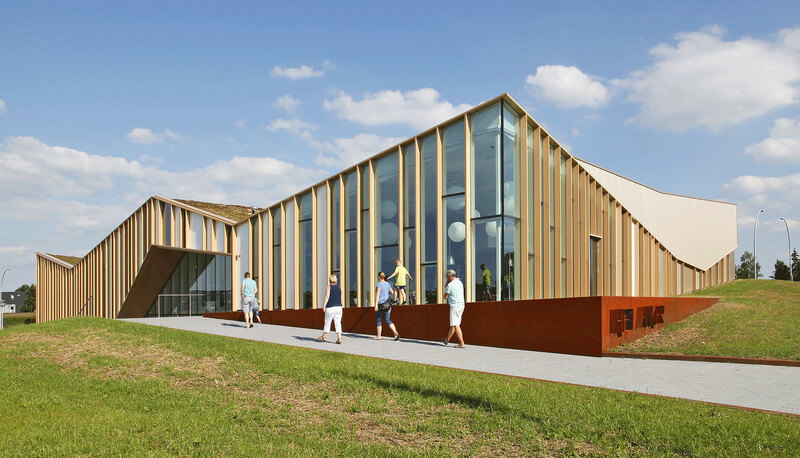 The multi-purpose complex created a challenge for the Dutch architectural firm. Their aim to appeal to a diverse group of users through sports activities, musical- and cultural events played a major role in the overall design. This led to an accessible building design constructed to draw people in through large interior views visible from the street level and the first floor. The building, that is nearly 10,000 square feet, offers a welcome centralized community center that opens up into several public zones. Alucobond aluminum composite material is a flat, durable aluminum material that is often specified for its modern architectural aesthetic. 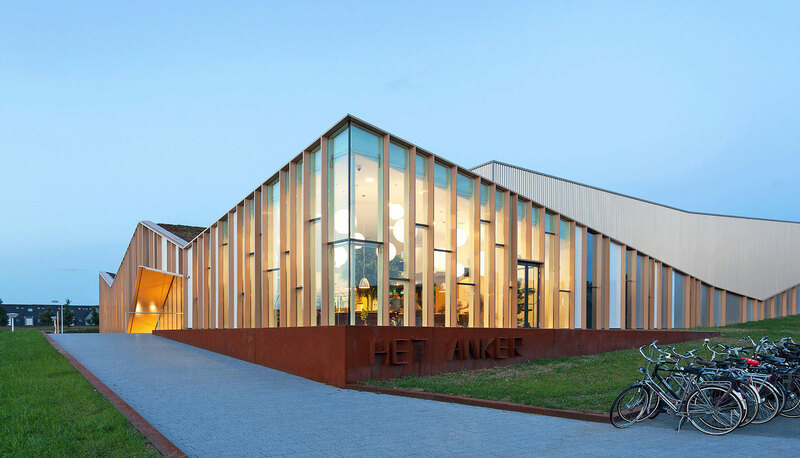 Het Anker is distinguished with a unique green roof and sparkling metal façade meant to behave like a public building without exuberant transparency. The specification of the aluminum composite panels resulted in brilliant, unconventional and modern solution.